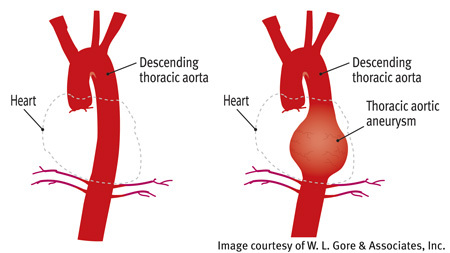 The aorta is the main artery that carries blood from the heart to the rest of the body. The aorta comes out from the left ventricle of the heart and travels through the chest and abdomen. A thoracic aortic aneurysm (TAA) is an abnormal bulge or "ballooning" in the wall of the aortic artery running through the thorax (chest). One in four aortic aneurysms are TAAs. An aneurysm that occurs in the part of the aorta running through the abdomen is an abdominal aortic aneurysm (AAA). Three in four aortic aneurysms are AAAs. An aneurysm that grows and becomes large enough can burst, causing dangerous, often fatal, bleeding inside the body. Many cases of ruptured aneurysm can be prevented with early diagnosis and medical treatment. Because aneurysms can develop and become large before causing any symptoms, it is important to look for them in people who are at the highest risk. When found in time, aneurysms can usually be treated successfully with medicines or surgery. If an aortic aneurysm is found, the doctor may prescribe medicine to reduce the heart rate and blood pressure. This can reduce the risk of rupture. Large aortic aneurysms, if found in time, can often be repaired with surgery to replace the diseased portion of the aorta. The outlook is usually excellent. Most aortic aneurysms do not produce symptoms, even when they are large. Only half of all people with aortic aneurysms notice any symptoms. Aortic aneurysms are identified more often now than in the past because of chest Computed Tomography (CT) scans performed for other medical problems. In a common type of thoracic aortic aneurysm, the walls of the aorta become weak and a section nearest to the heart enlarges. Then the valve between the heart and the aorta cannot close properly and blood leaks backward into the heart. Less commonly, a TAA can develop in the upper back away from the heart. A TAA in this location can result from an injury to the chest, such as from an auto crash. An aneurysm can result from atherosclerosis (hardening and narrowing of the inside of arteries). As atherosclerosis develops, the artery walls become thick and damaged, and lose their normal inner lining. This damaged area of artery can stretch or "balloon" from the pressure of blood flow inside the artery, resulting in an aneurysm. An aneurysm also can develop from constant high blood pressure inside an artery. A thoracic aortic aneurysm can result from an injury to the chest (for example, an injury that occurs from an auto crash). Certain medical conditions, such as Marfan syndrome, that weaken the body's connective tissues, also can cause aneurysms. In rare cases, infections such as untreated syphilis (a sexually transmitted infection) can cause aortic aneurysms. Aortic aneurysms also can occur as a result of diseases that cause inflammation of blood vessels, such as vasculitis. What Are the Signs and Symptoms of a Thoracic Aneurysm? The signs and symptoms of an aneurysm depend on its type, location and whether it has ruptured or is interfering with other structures in the body. Aneurysms can develop and grow for years without causing any signs or symptoms. It is often not until an aneurysm ruptures or grows large enough to press on nearby parts of the body or block blood flow that it produces any signs or symptoms. An aneurysm may be found by chance during a routine physical exam. More often, an aneurysm is found by chance during an x-ray, ultrasound or Computed Tomography (CT) scan performed for another reason, such as chest or abdominal pain. Medicine and surgery are the two types of treatment for an aneurysm. Medicines may be prescribed before surgery or instead of surgery. Medicines are used to reduce pressure, relax blood vessels and reduce the risk of rupture. Beta blockers and calcium channel blockers are the medicines most commonly used. Surgery may be recommended if an aneurysm is large and likely to rupture. Treatment recommendations for aortic aneurysms are based on the size of the aneurysm. Small aneurysms found early can be treated with "watchful waiting." If the diameter of the aorta is small-less than 3 centimeters (cm)—and there are no symptoms, "watchful waiting" and a follow-up screening in five to 10 years may be all that is needed, as determined by the doctor. If the aorta is between three and four centimeters (cm) in diameter, the patient should return to the doctor every year for an ultrasound to see if the aneurysm has grown. If the aorta is between four and 4.5 cm, testing should be repeated every six months. If the aorta is larger than five cm (two inches around or about the size of a lemon) or growing more than one cm per year, surgery should be considered as soon as possible. Two main types of surgery to repair aortic aneurysms are open chest repair and endovascular repair. More information is available on the Cardiovascular Center Aortic Aneurysm website page.